You’ll love these colorful tacos. I make them with pork tenderloin, the leanest cut of pork–and one of the easiest to cook. This dish is loaded with seasonings and topped with a super-easy coleslaw that’s absolutely delish. It’s festive, fun and flavorful. Pat the pork tenderloin dry with paper towels. Sprinkle the meat on all sides with ¼ teaspoon of the salt and the black pepper. Liberally coat a large pot with oil spray and preheat it over medium-high heat. Place the tenderloin in the pot and cook until browned on all sides, 2 to 3 minutes per side. Pour the chicken broth into the pot and add enough water to just cover the tenderloin. Add the peppercorns and bay leaves and bring the liquid to a boil. Reduce the heat to low, partially cover the pot and simmer the tenderloin until cooked through, about 40 minutes. Remove the tenderloin form the pot and set it aside to cool. Discard the cooking liquid and solids that form in the pot (you will reuse this pot to make the pork filling). While the meat is cooling, prepare the Sassy Slaw: Place the coleslaw mix in a large mixing bowl. Cut the carrots into long, thin ribbons with a vegetable peeler, or grate them on the large side of a box grater. Add the carrots to the coleslaw mix and toss to combine. In a small bowl, prepare the coleslaw dressing: Whisk together the cider vinegar, lime juice, red pepper flakes, honey and salt. Pour the dressing over the coleslaw mixture and toss well. Store in the refrigerator. When the tenderloin is cool enough to handle, shred the meat into thin strips and reserve. Return the pot to medium heat and liberally coat it with oil spray. Add the onion, red bell pepper, garlic, cumin, oregano and chili powder, and cook until the onion is soft, about 5 minutes. Add the shredded pork, tomatoes, and green chiles, and simmer until heated through, about 10 minutes. While the pork filling is simmering, preheat the oven to 350˚. Arrange the corn tortillas on a baking sheet, overlapping them as necessary and bake uncovered for 8 to 10 minutes to warm them. Meanwhile, remove the pork filling from the heat and cover the pot to keep it warm. 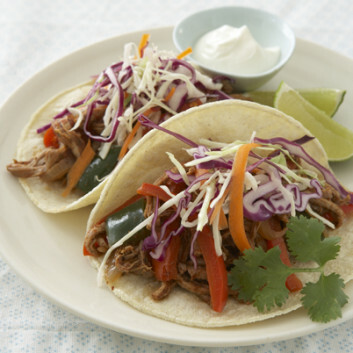 To serve, fill each tortilla with about ½ cup of the pork mixture and garnish with 1 tablespoon of the sour cream. Add the cilantro and lime wedges if desired. Top each taco with about 2/3 cup of the Sassy Slaw or serve it alongside.